In order to show some of the basic functionality of the Sports Tracker I went for a 10km ride on my bike. After you start Sports Tracker you see following screen. I will not explain every thing here but only menu items that where used in the concrete example. The first thing to do is to select “New Workout”. 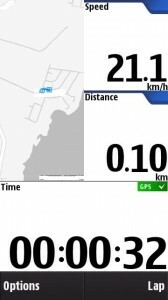 Then a new screen enables you to select the type of activity (walking, running, cycling, etc.). The live sharing option is not used in this examples. I will come back to that later. 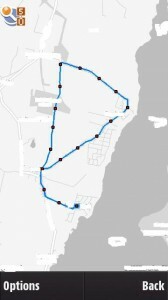 If you earlier had been cycling on this route and saved it as a named route, you should select the route in the “Route” item. This enables you to compare this workout against others on the same route. The auto-lap functionality is set. I normally set it to 500m interval. Then just press ok and your are ready to go. 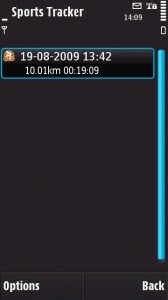 Another option for the log screen is to see “speed last km” or “pace last km”. This is why it could be nice to have it attached directly to the handlebars to switch between the viewing options. When you have raced the planned distance, go into the “options” menu and press “stop”. It then shows the last lap status as can bee seen below. It has lap number, the speed, distance, altitude and lap time. 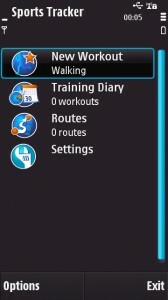 The you press “ok” and the total workout summary screen is shown. 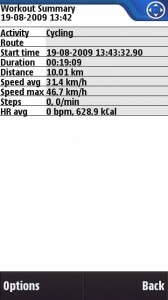 It list the total distance, the total time the workout lasted, the average speed and the energy used during the workout. This is calculated from the user setting which has data like name, age, male/female, weight. Then later, if you want to see the details of a specific workout you just start Sports Tracker. The training diary now shows the total number of workouts you have in the database. In this case only one is present. When the “Training Dairy” item is selected a calendar view of all your workouts are shown. In the screen dump there seems to be a little bug in the version I am using, since the dates are offset from the week numbers and weekdays. But is it a minor thing that most likely is solved in a newer version. So just select one of the dates where a workout is present. In this case the 19th of August is selected. Here is one little strange thing, I think. 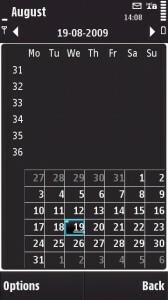 If you have many workouts on several different days, and for instance the 19th is selected as in this case, a new screen opens up which is a “list view” of all the workouts and not the one(s) from the day you just selected. This could be improved. In the list view below, only one workout is listed and the reason for that is that I only have one workout in total when that screen dump where made. So just select the workout you want to see the log details for. Then if you touch the screen with your finger and kind of push the screen towards the top, a new screen slides in from below. 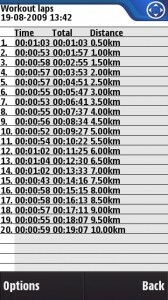 It is the summary of the lap times. It is very good to use this for setting new goals for your future lap times. 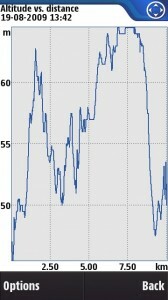 It is obvious that I have to target sub-55 seconds in the near future to improve myself. There are a few more curves but they are related to heart rate monitoring, so I well come back with more information about them later. It is also possible to see for instance average speed as a function of all the workouts you have done on a specific route. This will also be explained when I have more log data. The route can also be viewed. 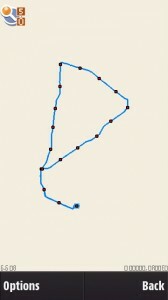 In the first example no underlying map is visible, but the proportions of the route is easily recognizable. This is all for now. 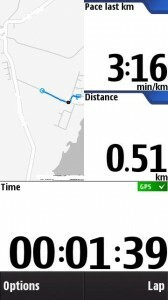 The post was intended to show the basic functionality of Sports Tracker. 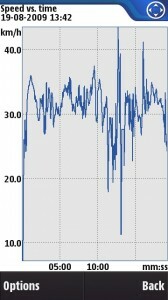 I will soon get back with more info on heart rate monitoring and exporting to google earth, real-time tracking and exporting to excel for further data analysis. 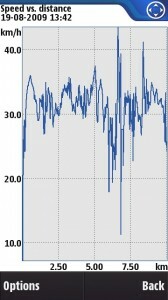 One good thing with Excel (or Open Office) is that you can cross correlate the altitude data and speed for instance. from where can i download this? But you know that Aluminum causes cognitive impairment and brain tumor. I can already tell that’s gonna be super heullpf. Sólo tienes que acceder a /. En esta web también podrás solicitar una ampliación de garantía de los 2 años habituales hasta 5 años, registrar tu electrodoméstico localizar el servicio técnico más próximo a tu domicilio si lo que deseas es adquirir algún recambio personalmente. Sus reparaciones tienen una garantía de 2 años y, en caso de que tu electrodoméstico ya haya pasado su propia garantía y debas abonar el costo del trabajo, podrás hacerlo con tarjeta con toda tranquilidad. It’s crazy how much the world is changing everyday but I love how much this site always stays up to date withcurrent news and information. I am experiencing some of these same issues as well. It looks like you comprehend a great deal about this subject. In my view, if all webmasters and bloggers made just right content material as you did, the web might be a lot more helpful than ever before.